For trout to find al of these foods, they primarily depend on vision. Using the monocular vision, they will spot the food and then change to binocular vision to bring it into focus. 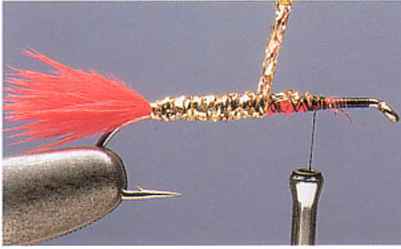 By using this method, trout can calculate the distance of their prey. In addition to vision, trout also use the lateral line on their body to detect vibration. With this method, they are able to distinguish the type of prey. Finally, the trout will use both smell and taste. Contrary to belief, the way a trout will take its prey from the surface of the water is by sucking the food right into its mouth. For the experienced angler, this is often referred to as a "casual take". If the prey is large, the trout will use its energy to lunge, which allows it to gulp and swallow the prey. This is referred to as an "aggressive take". However, there are times when the trout will use a combination of both the "casual" and "aggressive" take by simply placing the food in its mouth before it swallows.